The sudden and unexpected passing of C. D. Wright in January of this year has robbed this country of one of our most distinguished poets. ShallCross, a distinctive collection, stands as a fitting memorial to Wright’s unique position in American letters. Hauntingly, mortality is woven through these poems like a dark, ubiquitous thread. The first poem in the collection “Some Old Words Were Spoken” opens at a graveside, and the central section of the book, the poem “Breathtaken” chronicles a series of murders and violent deaths taken from New Orleans’ NOLA.com Crime Blog. On balance, it must be noted that Wright’s works in general, and ShallCross in particular, are immanently life affirming. To address life, Wright has always dealt in a measured way with death and violence, with pain and grief. Born in Arkansas, her work remains predominantly southern in its roots, southern in its affinity for troubled themes. ShallCross is broken into sections. “40 Watts” is a series of short lyrics, each lyric containing the word poem somewhere in the title. The reader knows everything—and nothing—about what is going on in each of these small masterpieces of compression. This non-telling of things is sometimes best. There is isolation and threat, omen and portent, locked into these lines. These are poems of work and grief and loss—synthesized moments telescoping days and years—poems that, rather than transcending meaning, exist somehow outside of it. Wright opens doors but does not try to take responsibility for the multifarious results. And it goes on, page after riveting page of ruined lives—the perpetrators as well as the victims—all of which Wright has presented with a matter-of-fact, deliberative sense of reportage. It is what it is. In a C. D. Wright poem, ink and watermarks can definitely carry emotional freight, black ink, of course, bearing at least a secondary connotation of the black-edged stationery used to announce a death. And then there are the treatises on the serial nature of living as laid bare in “from The Obscure Lives of Poets,” a kaleidoscope of impressions across time and space, heavy with revelations, mysteries, all the rest—obscurity, obscurity loud at the doorstep of contemplation, these poems issuing invitation after invitation for a multitude of tastes and reflective concerns. In these poems, materiality may be obscure or imaginary, but it is in no way less real, less sensuous, less terrible, less precious. The actors in these poems are repeatedly onstage, as if the locals and the environments demand performances of a definitive nature—ergo the gusto alternating with the dramatic reserve. 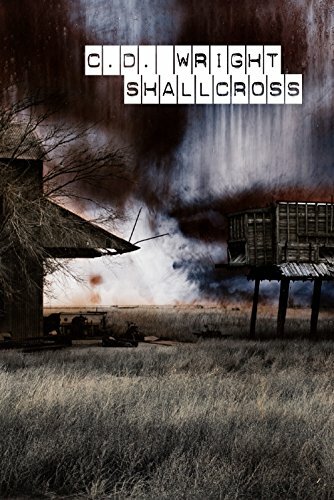 ShallCross is indeed a “seminar for the heart,” the last such seminar we will have from the pen of C. D. Wright. It completes her outstanding legacy, a legacy that will persist as long as there are situations to confront, encounter, to consider—the many complications of same—all that has been variously reflected in her writings before, the news of what has been left behind. This is a volume rich with the wisdom of one of our finest poets, a book laced with darkness and saturated with light.